Asking a class group of 11-year-olds to use empathy begins by examining a series of images and quotes from all over the world taken from The World Health Organization. Students identify issues, themes and challenges before brainstorming possible solutions. As per the rules of brainstorming developed by IDEO we encourage our students to practice active listening and collaborate as equals. We build on the ideas of others; we defer judgement and encourage wild ideas – as they are usually the most fun! Next we get busy working on prototypes to communicate our design ideas using craft materials and littleBits, interactive building blocks that allow students to create simple and complex circuits using sensors, light, sound and movement. Recently I attended the Designing for Dementia Symposium hosted by the QUT Creative Industries Faculty. The overriding message was how design can promote individuality, wellbeing and empowerment. Cathy Treadaway from The LAUGH Project in Wales demonstrated research that indicates hand-held, playful objects might improve the wellbeing of those living with dementia. Gail Kenning from the University of Technology in Sydney discussed her approach of individualising design by way of considering particular people with particular needs. This sentiment connected to another presentation on De Hogeweyk’s Village near Amsterdam; a dementia care facility designed with seven ‘house concepts’. Residents live in purpose-designed houses that emulate and connect to their individual style, personality and lifestyle before dementia. I’m looking forward to sharing some of these real-life examples with our students in our next Age Friendly City workshop on 9 May. As a learning experience, Age Friendly City is much more than a bit of creative fun. Through the process of empathising with and designing for others, I regularly observe our students also experiencing feelings of individuality and empowerment. As we encourage their ideas and applaud their creative problem-solving we are also providing opportunities to connect our students to their own sense of self-worth, the value of which cannot be underestimated. As the world becomes more complex and digitally connected the role of empathy becomes more and more important as we become more isolated. In the future Echo will continue to build a culturally diverse archive of stories and identities with the intention of finding a new personalised, emotive tool to connect people and tackle the epidemic of loneliness of our digital age. Echo will be screening at The Cube until Friday 28 April. The girls participated in three hands-on workshops exploring wearable technologies, STEAM Entrepreneurship and webcam-hacked microscopes with artist / scientist, Jaden Hastings, to create DIY microscopes. The first presentation was from Dana Winkworth, Systems Administrator from The Cube who talked about her experience working in Information Technology in a male-dominated field. Previously she worked for Maccquarie Group in London and Brisbane and is now enjoying great work/life balance managing the IT infrastructure in The Cube studio. Her tip for the girls was ‘do what you would do, if you knew you couldn’t fail’. The second presentation was from Svenja Kratz, a new media artist interested in the intersections between science and art. Svenja is currently Science Art Lab + theme leader within the Creative Exchange Institute and works as a Lecturer in Interdisciplinary Creative Practice at University of Tasmania. She spoke about her BioSynethetic Systems exhibition which opened at Creative Industries Precinct on Saturday 25 March. The last presentation was from Jaden Hastings whose work focuses upon the intersection and interplay of art and science – from philosophy to praxis – merging scientific and artistic research, challenging the norms of both disciplines, and moving them into new spaces for exploration. A month under my belt and still two to go. The project is growing limbs by the second and each day seems more exciting than the last. Tech wise our facial tracking application is well on the way to having the main functionality working smoothly. Here’s a taster video of the first stage recorded live from the application with a few treatments added. The next stage is user interface design and narrative content. It’s time to bring fiction, drama and sound to the work so you might see me cruising around Kelvin Grove campus collecting and researching personal stories. Don’t be shy, come and say Hello and get involved in my project. Over the next three weeks I’ll use this research to write some intimate stories with the help of the creative writing and drama students. These narratives will be integrated into the final user experience where you literally see through someone else’s eyes, kickstarting the empathy engine.. Still so much to do but with the support of The Cube and the Creative Industries team, anything is possible! 2016 was a big one for us with the Dino Zoo Holiday Program attracting over 24,000 visitors in January 2016. For all you dinosaur lovers, you can still catch Dino Zoo on our screens, check Cube Screens for dates/times. Lauren McCarthy completed the TRANSMIT³ Residency, The Changing Room, which explored the potential of The Cube as a “smart social environment,” responsive to the mood and activity of the people that inhabit it. The Changing Rooms was a custom software installation and performance that allowed participants to select one of hundreds of emotions, evoking that emotion in them and everyone in the space through a layered environment of light, visuals, sound, text, and interaction exhibited over a multi-level, many-sided display. Dealing with themes of surveillant architectures, social technologies, and smart homes, the piece simultaneously invades and cares for the emotions of passersby. Read more about Lauren’s final performance. Physics Observatory launched in September school holidays and a very successful holiday program and Physics Fun Day followed in January 2017. At the moment our public programs team are busily preparing for the Easter Holiday Program which we can reveal involves a QUT exclusive from Street Science. Sign up to the holiday eNews to be the first to hear about bookings. Their Majesties King Willem-Alexander and Queen Máxima of the Netherlands visited QUT to launch a flood management tool and summit that could help protect their country and Queensland. The Dutch royals, making their first visit to Australia since taking the throne, were shown the Smart Scanner for Water Resilient Cities, developed by QUT’s Dutch collaborators Deltares and HydroNET, during their visit to QUT’s Gardens Point campus. Translated on to The Cube’s screens, QUT researchers demonstrated the tool’s ability to predict likely flood impacts from a mix of different local measures and contrasting weather events. Read more about this in QUT’s news story. The Cube Studio are busily developing their new screen project Code-A-Bot for launch at Robotronica 2017. Code-A-Bot will allow people to work together to run a recycling factory as efficiently as possible. You will need to attach parts to your own robot and then code the robot on the screen in order to perform tasks. 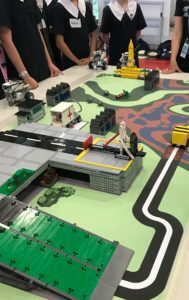 This will be a great introduction to coding and will showcase QUT’s robotics initiatives, while also inspiring group collaboration and a greater understanding of resource management. Georgie Pinn’s residency Echo is underway and we are excited to see what comes of her research project which uses interactive facial detection technology, combined with animation and sound. Read more about Georgie in her first blog post. I’m a multimedia artist completing a residency at The Cube for the next three months. My creative practice has, for many years, used technology to explore notions of physical and emotional empathy. Here and now I’ll be developing a project called Echo. Over the next few months I’ll be designing elements and software for an interactive installation that is a morphing virtual mirror. The viewer will be able to customise an interchangeable avatar and fragment and mix their own face with the features of other people and animals, creating a range of morphing hybrid personalities. We’re also developing a real time facial tracking application that copies your expressions as you wear anothers face or multiple faces. I want to explore how we respond to our face being fragmented and manipulated by others and if it is possible to build community by developing a truly ‘shared’ identity? Does a combined identity extend the parts of us or dilute us? What can we learn about narcism and empathy through this experience? And what can we learn about micro expressions? In April the installation will run and the animated portraits will be installed into The Cube with an event that showcases the application as a live tool for Public performance. Putting the fun back into physics! On Saturday 7 January, 4,200 visitors flocked to The Cube for an extra dose of physics fun to celebrate the opening of the Physics Observatory Summer Holiday Program. We presented a range of Physics-inspired workshops including Hula Hooping by Vulcana Women’s Circus, live science shows by Street Science, a 3D flight simulator game facilitated by the QUT STEM for Schools team and Physics 101 workshops from QUT Physics Society. The live science shows by QUT Alumni Steve Liddell were a massive hit! Kids were amazed by Steve’s science experiments including exploding balloons with liquid nitrogen and a real hand-held fireball. Activities from Physics Observatory Holiday Program also ran throughout the day including Physics Wiz Treasure Hunt which allowed families to discover hidden elements of the Holiday Program. Kids were also awarded a ‘Physics Wiz’ sticker! Other activities included Ball Run, which encouraged kids to compare how far and fast balls can travel using tubes and everyday materials on a magnetic wall. Take to the Sky was another popular (paper plane making) activity, which got kids thinking about gravitational forces and how fast and far their planes could fly. We also announced the winners of the ‘Life on Mars’ Competition. Kids were asked to draw what they imagined life on Mars might look like incorporating what they know about STEM. Banjo Seaniger (8 years) won an Xbox One and Runners up Shaun Gareth (13 years) and Mikayla Daley (12 years) won admission to one of The Cube’s 2017 holiday programs. Thanks for everyone who joined us for Physics Fun Day and for those who couldn’t make it Physics Observatory Holiday Program continues everyday 10am-4pm until Sunday 15 January. Check out this video for a taste of the program.